Billy Goat s self-propelled overseeder reduces fatigue associated with pushing and features intuitive forward and reverse operator controls. New to the unit is a blade design with a new foot actuated height adjust that raises and lowers the reel effortlessly, providing more blade depth. 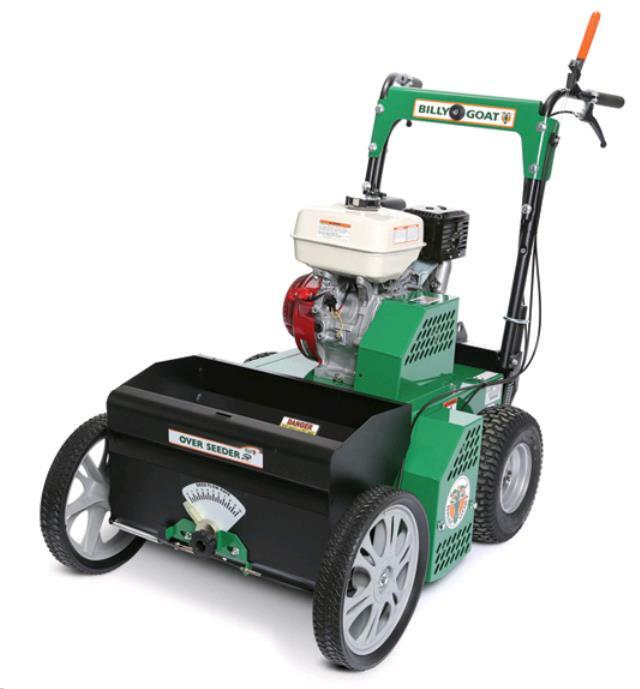 The unit is 31 wide with an exclusive 11-blade slicing reel that floats along contours of yards increasing seed to soil contact and improving germination rates (18" SEEDING WIDTH). The unit comes standard with a 30 lb. seed box that is generously elevated above the turf to eliminate any clogging that may occur from moisture. Billy Goat s exclusive Auto Drop system automatically starts and stops seed drop with bale engagement and disengagement conserving seed and preventing end-of-run seed piling. * Please call us with any questions you may have about our over seeder billy goat in Hamel MN, Plymouth MN and the Twin Cities.